With spring just around the corner (we hope! ), we start that tricky time of year where our wardrobe is in a transitional period. So with that in mind, we thought we would help you prepare with a guide to our must-have pastel and floral print coats and knitwear. With these staple pieces, you will be able to transition in style and perfect the art of layering all at the same time. So let’s go ahead and take a look at what pieces you won’t be able to resist this season. No matter the time of year, beautiful knitwear is a wardrobe staple. Perfect for layering up or wearing in place of a jacket when the weather is warmer. We have also created some gorgeous pastel jackets which will keep you warm and up to date with this seasons must have layer. This rose colour wisks you away from the wintry shades and prepares you for spring. Discover our collection of fresh florals to update your wardrobe effortlessly. Our stylish range is perfect for introducing fun into your day-to-day outfits. 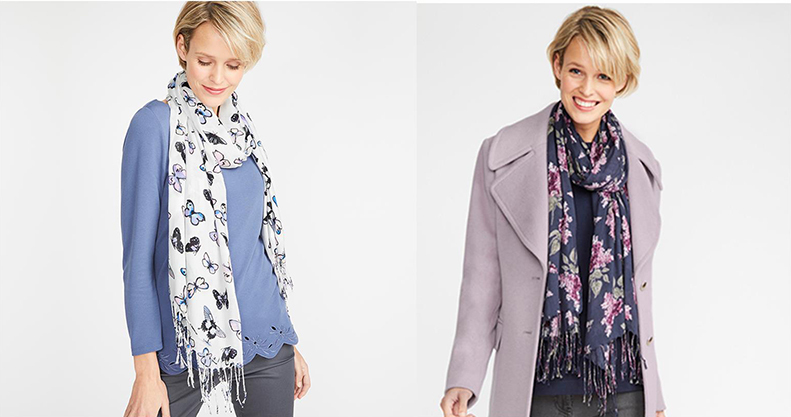 Why not take a look at some of our gorgeous printed scarves. These staples are perfect for transitioning between seasons. They will keep you warm acting as another layer without the weight of a coat. And also adds a pop of colour! With these must-have staples you won’t only be staying warm, you’ll also be looking fab with some stylish new wardrobe additions. Do you have a favourite coat or jumper that sees you through the transitioning seasons? Let us know below or @LauraAshleyUSA. This entry was posted in In Style and tagged blazers, blouse, cardigan, coats, fashion, fashion blog, fashion blogger, fashionista, fashions, henley, jackets, knitwear, laura ashley clothes, lilac, pashmina, pashminetta, pastels, scarf, scarves, spring, spring fashion, spring looks, style, sweater, women's fashion. Bookmark the permalink.